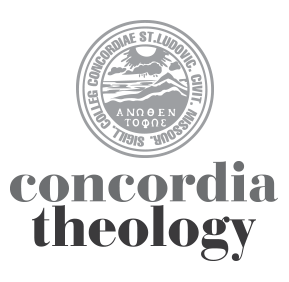 The most recent issue of the Concordia Journal features several items on C. F. W. Walther, the founder of Concordia Seminary and a key figure in the founding of what is now the Lutheran Church — Missouri Synod. 2011 is the 200th anniversary of Walther’s birth. Countless pieces by Walther have appeared in the journals produced by Concordia Seminary; scanning over a bibliography of his writings, compiled by Dr. Tom Manteufel for Concordia Journal, one title caught my eye: “Walther on Sola Scriptura: C. F. W. Walther’s 1984 Synodical Conference Essay.” Jim Ware, who now teaches classical languages and New Testament at the University of Evansville, “translated and condensed” the essay. It appeared in the October, 1988 issue, pp. 363-73. A few passages struck me as significant, even as we reflect on Walther and his writing. Walther himself gives some helpful reminders about the role of “tradition” in the study of theology. We see this from the example of Jesus Christ in Matthew 4:4-10. What an astonishing spectacle, which all angels and archangels looked upon with amazement, that the Son of the living God, when he struggled with the devil, only quoted Scripture! We could not have a more glorious proof for how we should conduct ourselves in doctrinal controversies. We should not say: “So says Gerhard! It is written in Hunnius! So says Hollaz!” But just as Christ did, so we also should say: “It is written”— namely, in Scripture. Christ does not even add the words “in Scripture,” because they are understood. Only the Bible is the book of all books. How do we learn from our ancestors in the faith, all the while keeping in mind that they may have erred, or stated something in a less helpful way, or, as frequently happens, are trying to answer questions that we don’t have any more. Very often they are simply not addressing the questions that are put to us today. How do we think — from Scripture — the way they thought, without insisting that we say it exactly like they said it? Hmmm… I’d be interested if other groups of Christians tend toward quoting their “fathers” as much as we do. Maybe we should ask the Covenant guys how often they drop “Calvin said” in their discussions. Luther is very informative and quotable, but I think his named is used as a trump card too often. Comforting words from Walther, at least to my ears! However, the problem still remains as to which interpretation of any given text is the correct one. By correct I mean the one that most closely and precisely conveys the original author’s (God’s) intended meaning. Before Sem I used to think that one can always arrive at an indisputably correct interpretation if one just studied enough. However, since even our own most learned exegetes disagree about various texts, this must not always be the case. The disagreements among the Early Church Fathers seem to further negate my pre-Sem assumptions. Perhaps dogmatics developed to avoid the endless debating of texts, variants, and meanings based on individual interpretations. This, of course, also begs the question of what precisely the “complete doctrinal unity” is that we claim to have amongst ourselves.